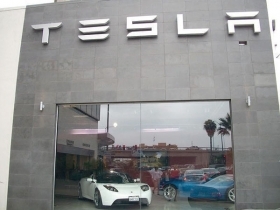 (Bloomberg) -- Tesla Motors Inc., the world's best-performing automotive stock this year, will join the Nasdaq-100 Index next week, filling the spot vacated by Oracle Corp., which is moving to the New York Stock Exchange. "It's a coming of age, recognition that a company has market cap and liquidity," said Sandy Mehta, chief executive officer of Value Investment Principals Ltd. in Hong Kong. "Once the stock joins the index, you will have some buying." On Monday, before the announcement, Tesla shares rose to a record of $121.61. The shares close Tuesday up $1.84 at $123.45. General Motors Co. rejoined the Standard & Poor's 500 Index last month after a four-year absence prompted by its 2009 bankruptcy. Tesla, based in Palo Alto, Calif., has forecast Model S sales will reach 21,000 units this year, with deliveries to Europe and Asia beginning in the second half. The Model S, which starts at $69,900 in the U.S., is Tesla's second vehicle after the $109,000 Roadster.